This Twitter feud has been going on for over a week, and I still don't know, or can even explain to you what kicked it off between, Wiz Khalifa, Kanye West, Amber Rose and Kim Kardashian. But all is reportedly over. 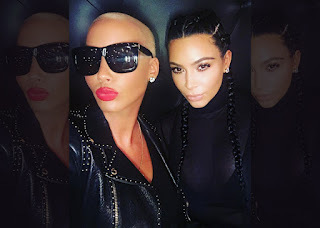 Amber Rose met up with Kim recently and the two beauties took a photo together to show everything is now calm between the families. Lol. Kim looks so stunning. I was literally going to give you guys a run down of how it all begun and what triggered the Twitter disses back and forth but I can't even be bothered tonight y'all..Lol. Check out the link below for more info about the argument and how it all started..